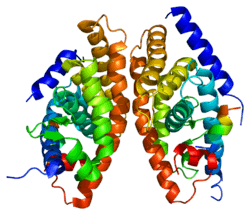 Liver X receptor alpha (LXR-alpha) is a nuclear receptor protein that in humans is encoded by the NR1H3 gene (nuclear receptor subfamily 1, group H, member 3). miRNA has-miR-613 autoregulates the human LXRα gene by targeting the endogenous LXRα through its specific miRNA response element (613MRE) within the LXRα 3′-untranslated region. LXRα autoregulates its own suppression via induction of SREBP1c which upregulates miRNA has-miR-613. The liver X receptors, LXRα (this protein) and LXRβ, form a subfamily of the nuclear receptor superfamily and are key regulators of macrophage function, controlling transcriptional programs involved in lipid homeostasis and inflammation. Additionally, they play an important role in the local activation of thyroid hormones via deiodinases. The inducible LXRα is highly expressed in liver, adrenal gland, intestine, adipose tissue, macrophages, lung, and kidney, whereas LXRβ is ubiquitously expressed. Ligand-activated LXRs form obligate heterodimers with retinoid X receptors (RXRs) and regulate expression of target genes containing LXR response elements. Restoration of LXR-alpha expression/function within a psoriatic lesion may help to switch the transition from psoriatic to symptomless skin. Liver X receptor alpha has been shown to interact with EDF1 and Small heterodimer partner. In 2016, a study found 70% of individuals in two families with a rare form of rapidly progressing multiple sclerosis had a mutation in NR1H3. ↑ "Diseases that are genetically associated with NR1H3 view/edit references on wikidata". ↑ "Drugs that physically interact with Oxysterols receptor LXR-alpha view/edit references on wikidata". ↑ Miyata KS, McCaw SE, Patel HV, Rachubinski RA, Capone JP (Apr 1996). "The orphan nuclear hormone receptor LXR alpha interacts with the peroxisome proliferator-activated receptor and inhibits peroxisome proliferator signaling". The Journal of Biological Chemistry. 271 (16): 9189–92. doi:10.1074/jbc.271.16.9189. PMID 8621574. ↑ Willy PJ, Umesono K, Ong ES, Evans RM, Heyman RA, Mangelsdorf DJ (May 1995). "LXR, a nuclear receptor that defines a distinct retinoid response pathway". Genes & Development. 9 (9): 1033–45. doi:10.1101/gad.9.9.1033. PMID 7744246. ↑ Christoffolete, MA; Doleschall, M; Egri, P; Liposits, Z; Zavacki, AM; Bianco, AC; Gereben, B (2010). "Regulation of thyroid hormone activation via the liver X-receptor/retinoid X-receptor pathway.". The Journal of endocrinology. 205 (2): 179–86. doi:10.1677/JOE-09-0448. PMC 3133926 . PMID 20176747. ↑ Korf H, Vander Beken S, Romano M, Steffensen KR, Stijlemans B, Gustafsson JA, Grooten J, Huygen K (Jun 2009). "Liver X receptors contribute to the protective immune response against Mycobacterium tuberculosis in mice". The Journal of Clinical Investigation. 119 (6): 1626–37. doi:10.1172/JCI35288. PMC 2689129 . PMID 19436111. ↑ "Entrez Gene: nuclear receptor subfamily 1". ↑ Gupta DS, Kaul D, Kanwar AJ, Parsad D (Jan 2010). "Psoriasis: crucial role of LXR-alpha RNomics". Genes and Immunity. 11 (1): 37–44. doi:10.1038/gene.2009.63. PMID 19798078. ↑ Brendel C, Gelman L, Auwerx J (Jun 2002). "Multiprotein bridging factor-1 (MBF-1) is a cofactor for nuclear receptors that regulate lipid metabolism". Molecular Endocrinology. 16 (6): 1367–77. doi:10.1210/mend.16.6.0843. PMID 12040021. ↑ Wang, Zhe; Sadovnick, A. Dessa; Traboulsee, Anthony L.; Ross, Jay P.; Bernales, Cecily Q.; Encarnacion, Mary; Yee, Irene M.; de Lemos, Madonna; Greenwood, Talitha (1 June 2016). "Nuclear receptor NR1H3 in familial multiple sclerosis". Neuron. 90 (5): 948–954. doi:10.1016/j.neuron.2016.04.039. Lay summary. Lehmann JM, Kliewer SA, Moore LB, Smith-Oliver TA, Oliver BB, Su JL, Sundseth SS, Winegar DA, Blanchard DE, Spencer TA, Willson TM (Feb 1997). "Activation of the nuclear receptor LXR by oxysterols defines a new hormone response pathway". The Journal of Biological Chemistry. 272 (6): 3137–40. doi:10.1074/jbc.272.6.3137. PMID 9013544. Auboeuf D, Rieusset J, Fajas L, Vallier P, Frering V, Riou JP, Staels B, Auwerx J, Laville M, Vidal H (Aug 1997). "Tissue distribution and quantification of the expression of mRNAs of peroxisome proliferator-activated receptors and liver X receptor-alpha in humans: no alteration in adipose tissue of obese and NIDDM patients". Diabetes. 46 (8): 1319–27. doi:10.2337/diabetes.46.8.1319. PMID 9231657. Peet DJ, Turley SD, Ma W, Janowski BA, Lobaccaro JM, Hammer RE, Mangelsdorf DJ (May 1998). "Cholesterol and bile acid metabolism are impaired in mice lacking the nuclear oxysterol receptor LXR alpha". Cell. 93 (5): 693–704. doi:10.1016/S0092-8674(00)81432-4. PMID 9630215. Miyata KS, McCaw SE, Meertens LM, Patel HV, Rachubinski RA, Capone JP (Nov 1998). "Receptor-interacting protein 140 interacts with and inhibits transactivation by, peroxisome proliferator-activated receptor alpha and liver-X-receptor alpha". Molecular and Cellular Endocrinology. 146 (1-2): 69–76. doi:10.1016/S0303-7207(98)00196-8. PMID 10022764. Venkateswaran A, Laffitte BA, Joseph SB, Mak PA, Wilpitz DC, Edwards PA, Tontonoz P (Oct 2000). "Control of cellular cholesterol efflux by the nuclear oxysterol receptor LXR alpha". Proceedings of the National Academy of Sciences of the United States of America. 97 (22): 12097–102. doi:10.1073/pnas.200367697. PMC 17300 . PMID 11035776. Chinetti G, Lestavel S, Bocher V, Remaley AT, Neve B, Torra IP, Teissier E, Minnich A, Jaye M, Duverger N, Brewer HB, Fruchart JC, Clavey V, Staels B (Jan 2001). "PPAR-alpha and PPAR-gamma activators induce cholesterol removal from human macrophage foam cells through stimulation of the ABCA1 pathway". Nature Medicine. 7 (1): 53–8. doi:10.1038/83348. PMID 11135616. Laffitte BA, Repa JJ, Joseph SB, Wilpitz DC, Kast HR, Mangelsdorf DJ, Tontonoz P (Jan 2001). "LXRs control lipid-inducible expression of the apolipoprotein E gene in macrophages and adipocytes". Proceedings of the National Academy of Sciences of the United States of America. 98 (2): 507–12. doi:10.1073/pnas.021488798. PMC 14617 . PMID 11149950. Li Y, Bolten C, Bhat BG, Woodring-Dietz J, Li S, Prayaga SK, Xia C, Lala DS (Mar 2002). "Induction of human liver X receptor alpha gene expression via an autoregulatory loop mechanism". Molecular Endocrinology. 16 (3): 506–14. doi:10.1210/me.16.3.506. PMID 11875109. Mak PA, Laffitte BA, Desrumaux C, Joseph SB, Curtiss LK, Mangelsdorf DJ, Tontonoz P, Edwards PA (Aug 2002). "Regulated expression of the apolipoprotein E/C-I/C-IV/C-II gene cluster in murine and human macrophages. A critical role for nuclear liver X receptors alpha and beta". The Journal of Biological Chemistry. 277 (35): 31900–8. doi:10.1074/jbc.M202993200. PMID 12032151. Steffensen KR, Schuster GU, Parini P, Holter E, Sadek CM, Cassel T, Eskild W, Gustafsson JA (May 2002). "Different regulation of the LXRalpha promoter activity by isoforms of CCAAT/enhancer-binding proteins". Biochemical and Biophysical Research Communications. 293 (5): 1333–40. doi:10.1016/S0006-291X(02)00390-X. PMID 12054659. Gbaguidi GF, Agellon LB (Jul 2002). "The atypical interaction of peroxisome proliferator-activated receptor alpha with liver X receptor alpha antagonizes the stimulatory effect of their respective ligands on the murine cholesterol 7alpha-hydroxylase gene promoter". Biochimica et Biophysica Acta. 1583 (2): 229–36. doi:10.1016/s1388-1981(02)00217-2. PMID 12117567. Pawar A, Xu J, Jerks E, Mangelsdorf DJ, Jump DB (Oct 2002). "Fatty acid regulation of liver X receptors (LXR) and peroxisome proliferator-activated receptor alpha (PPARalpha ) in HEK293 cells". The Journal of Biological Chemistry. 277 (42): 39243–50. doi:10.1074/jbc.M206170200. PMID 12161442. Oberkofler H, Schraml E, Krempler F, Patsch W (Apr 2003). "Potentiation of liver X receptor transcriptional activity by peroxisome-proliferator-activated receptor gamma co-activator 1 alpha". The Biochemical Journal. 371 (Pt 1): 89–96. doi:10.1042/BJ20021665. PMC 1223253 . PMID 12470296. Wang M, Thomas J, Burris TP, Schkeryantz J, Michael LF (Nov 2003). "Molecular determinants of LXRalpha agonism". Journal of Molecular Graphics & Modelling. 22 (2): 173–81. doi:10.1016/S1093-3263(03)00159-1. PMID 12932788. NR1H3 human gene location in the UCSC Genome Browser. NR1H3 human gene details in the UCSC Genome Browser.